Agricultural species are subjected to a variety of biotic and abiotic stresses, which are the main limitations to crop production. In this context, contamination by trace elements is characterized as an abiotic stress that represents an environmental problem. Due to the physical and chemical similarities between cadmium and zinc, these elements may interact in the environment and may cause antagonistic or synergistic effects. In this way, physiological mechanisms to exclude, detoxify or compartmentalize trace elements that are in excess are crucial for plant survival when exposed to high concentrations of these elements. In this way, the aim of this study was to understand the physiological responses of Phaseolus vulgaris plants subjected to increasing doses of Cd and Zn for 21 days in different soil, Cambisol and Latosol. The activity of antioxidant enzymes, such as SOD, CAT, and APX; hydrogen peroxide content; lipid peroxidation; chlorophyll index; photosynthetic rate; stomatal conductance; and transpiration were analysed. 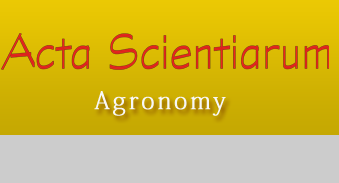 The data obtained showed a specific behaviour of Phaseolus vulgaris plants in each soil analysed. Moreover, it was observed that interactions between both elements resulted in a synergistic effect, negatively affecting all of the parameters analysed. trace elements; antioxidante enzymes; ROS; photosynthesis; synergism. American Public Health Association [APHA]. (1998). Standard methods for the examination of water and wastewater. Washington, D.C.: Water Environmenttal Federation, Ed 20. Buege, J. A., & Aust, S. D. (1978). Microsomal lipid peroxidation. Methods in Enzimology, 52, 302-310. Cherif, J., Mediouni, C., Ben Ammar, W., & Jemal, F. (2011). Interactions of zinc and cadmium toxicity in their effects on growth and in antioxidative systems in tomato plants (Solanum lycopersicum). Journal of Environmental Science, 23(5), 837–844. Conselho Nacional do Meio Ambiente [CONAMA]. (2009). Resolução no 420, de 28 de dezembro de 2009. “Dispõe sobre critérios e valores orientadores de qualidade do solo quanto à presença de substâncias químicas e estabelece diretrizes para o gerenciamento ambiental de áreas contaminadas por essas substâncias em decorrência de atividades antrópicas. Diário Oficial da República Federativa do Brasil, Brasília, DF, nº 249, de 30/12/2009, 81-84. Fundação Estadual do Meio ambientes [FEAM]. (2011). Valores orientadores para solos e águas subterrâneas no estado de Minas Gerais. Belo Horizonte, MG: Legenda expandida. Giannopolitis, C. N., & Ries, S. K. (1977). Superoxide dismutases: I., ccurrence in higher plants. Plant Physiology, 59(2), 309-314. Havir, E. A., & Mchale, N. A. (1987). Biochemical and developmental characterization of multiple forms of catalase in tobacco leaves. Plant Physiology, 84(2), 450-455.
International Standard Organization [ISO]. (2013). ISO 11.269-2: determination of the effects of pollutants on soil flora, part 2: effects of chemicals on the emergence and growth of higher plants. Geneva, SW : ISO. Malavolta, E. (1981). Manual de química agrícola: adubos e adubação. Campinas, SP: Agronômica Ceres. Minolta Camera LTDA (1989). Manual for chlorophyll meter spad 502. Osaka: Radiometric Instruments Division, 22. United States Environmental Protection Agency [USEPA]. (1998). Trimmed Spearman–Karber estimation of LC50 Values. Washington, US: USEPA. Ying, R. R, Qiu, R. L., Tang, Y. T., Hy, P. J., Chen, H. R., & Shi, T. H. (2010). Cadmium tolerance of carbon assimilation enzymes and chloroplast in Zn/Cd hyperaccumulator Picris divaricata. Journal of Plant Physiology, 167(2), 81-87. DOI: 10.1016/j.jplph.2009.07.005.